After you create a formatted Excel table, it's easy to turn the Total Row on or off. When you first add the Total Row, Excel automatically puts a Subtotal formula into the last column of the total row, to show a sum or count of the items in that column. If the entries are all numbers, the first argument is 109 – SUM. 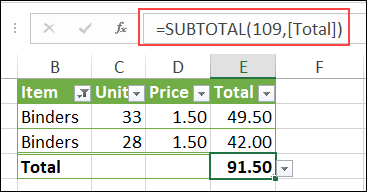 Excel uses the SUBTOTAL function in the total row, because that function only calculates the total for items that are visible after applying a filter. You can replace the automatic formula in the Total Row, if you prefer, and you can add Total formulas in other columns. 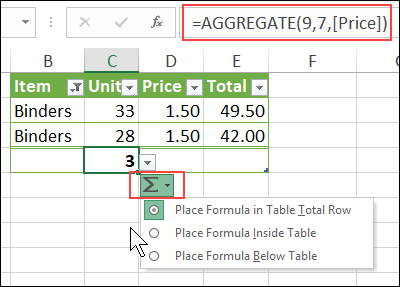 For example, add an AGGREGATE formula in the Total row -- it has more functions and options than SUBTOTAL. Totals at Bottom or Top? When you have a list or table on a worksheet, do you like to show the totals above that, or at the bottom? In my Excel files, the Total row is usually hidden in the formatted Excel Tables. If totals need to be shown, I put formulas above the table, or I build a pivot table on a different sheet, and show the totals there. With the built-in Total Row for Excel tables, there isn't an option to show the totals at the top. It's the bottom, or nothing. But, if you like to show the Total row, you don't need to hide that row, when it's time to add data at the bottom of the table. Use one of the following methods to add data to Excel Table with Total Row showing. With both methods, the Total row moves down automatically. This animated screen shot show the Tab method. This animated screen shot show the Copy and Paste method. See more Excel Table tips on my Contextures site. There is also a sample workbook to download, so you can test these Table techniques. Excel Tables: A Complete Guide, by Zack Barresse and Kevin Jones. can you pls helm me?